» [SOLVED] How to get 'Dynamic User' out of your login screen? [SOLVED] How to get 'Dynamic User' out of your login screen? I use archlinux with xfce and lightdm. Today, I find a 'Dynamic User' name in the lightdm login user select list. I searched with Google, and found nothing about "Archlinux lightdm Dynamic User". Any one can explain this for me? I can not sleep well with this strange 'Dynamic User' in my heart, thanks! Is this Dynamic User normal? How can people get it out of the login user list? 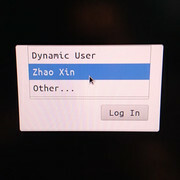 If accountsservice is installed, then lightdm uses it to determine whether a user should be shown in the login screen. If it is not installed, then /etc/lightdm/users.conf is used. You can probably add the dynamic user there to hide it without accountsservice. Can you see a dynamic user in the output of "getent passwd"? What is the exact line? Edit: I think it should be enought to add /sbin/nologin to the hidden shells. First, this user is not in '/etc/passwd', but 'getent passwd' command shows this user! Second, 'Dynamic User' is the long name of the user 'systemd-timesync'! Third, 'systemd-timesync' account is a 'nologin' one, and its shell is '/sbin/nologin', while '/etc/lightdm/users.conf' only hide for '/bin/false' and '/usr/bin/nologin', so this strange 'Dynamic User' was displayed in my login screen. At last, I uninstalled the 'accountsservice' package and add '/sbin/nologin' to file '/etc/lightdm/user.conf' as progandy said, now this problem is solved! Re: [SOLVED] How to get 'Dynamic User' out of your login screen? Now, I just want to know if this Dynamic User is normal and can I get it out of my login form. I think it was not there days before. If you had found the page, you should have mentioned that. What don't you understand. I don't use lightDM, so I cannot test it myself, but it seems pretty straightforward: if DynamicUser=yes enables it, I'm pretty sure DynamicUser=no would disable it. The lightdm-greeter is enumerating all UIDs 1000 and over and that would include any dynamic users created for any running service. Switching services from DynamicUser=yes to DynamicUser=no may also cause the service to break if for instance on a clean install the systemd-resolve and systemd-network users would not exist. I think people are making the Linux environment more and more complex. Distributions, Tools, Histories, Codes, Settings, Changes, Stories, Depends ... all is so hard a work to any new Linux leaner, and even to some of them after years. You can't really complain about complexity when you voluntarily installed bloat like a display manager. This is a complete shot in the dark as I'm not familiar at all with LightDM but what are the chances this is some kind of guest account functionality? Maybe jokes's anwser can sovle this problem, while fhdk's anwser does solve this problem, but why? I used Ubuntu for years, and I start to use archlinux and archlinux only now. I think archlinux will make me understand more about the Linux. Thanks for all! "systemd-timesync:*:62583:62583:Dynamic User:/:/sbin/nologin" is in the output of command `getent passwd`. '/etc/passwd' has no this user, but 'getent passwd' command shows this user! I see now! 'Dynamic User' is the long name of the user 'systemd-timesync'! This 'systemd-timesync' account is a 'nologin' one, and its shell is '/sbin/nologin', while '/etc/lightdm/users.conf' only hide for '/bin/false' and '/usr/bin/nologin', so this strange 'Dynamic User' was displayed in my login screen...........right? Maybe making a LFS is what I should do to learn Linux. @progandy any ideas why accountservice is showing Dynamic User even though Dynamic User has a shell of /sbin/nologin ? @loqs: accountsservice does hide the Dynamic User. It detects that the basename is nologin and ignores the path, so it doesn't matter if the shell is set to /some/strange/path/nologin. You can use lightdm without accountsservice, though. In that mode lightdm checks for absolute paths and not basenames and the /sbin/nologin entry was missing from the lightdm users.conf configuration. @progandy see post #16 zhaoxin fixed the issue by uninstalling accountservice then adding /sbin/nologin to hidden shells. zhaoxin wrote the problem is solved "too". I read that as accountsservice worked. Then he tried it with hidden shells instead and that worked as well. After I did an upgrade with -Syu I ended up with this Dynamic User at login screen as well. None of these worked for me. First tried installing accountsservice, didn't help. I'm not using lightdm so I had to try alternative for KDE and it worked. I created a pull request for LightDM. Maybe maintainers will merge it. In this case, systemd's dynamic users won't be shown by default.